The Ronin Brand Insignia is a high quality Pearl Weave that offers a very cool, clean look, but some very understated and classy added flair. 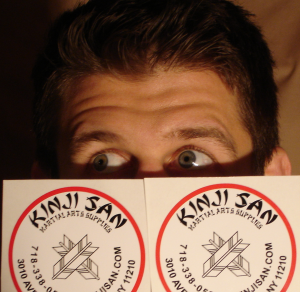 My Ronin Brand Insignia came from Kinji San Martial Arts in Brooklyn, NY. I had the great opportunity to speak with Doug from Kinji San for a while on the phone about the various gis that they carry, especially the Ronin Brand Insignia and I definitely suggest that if you live in New York, you get there right away, and if you don’t, give Doug a call because his customer service is top notch! The Ronin Brand Insignia fit me perfectly right out of the box (so to speak). Everything fit flush and perfect and I felt like I had complete mobility while wearing the gi. I believe that they fit true to size (not too big, or too long), and since I didn’t wash mine in hot water or put it in the dryer, there was little to no shrinkage. The design on the Ronin Brand Insignia is very classy and basic (no back patch like the Ronin Brand Fighter Gi). The stitching is all very straight and I didn’t find any dropped, missized, or broken stitches. The gi has some logo hits on the shoulders and some really cool Ronin taping along the outside of the pant leg, but that’s it! A very clean look for a really nice pearl weave gi. Like I said above, the Ronin Brand Insignia jacket fit me perfectly. My other pearl weave, the Black Eagle predator, is very similar in collar and weave, but the cut is a bit different because the Ronin Brand Insignia doesn’t bunch up in the chest when I pull the skirt flush at the bottom. The jacket was great with a very tailored fit for my fat self, but one that didn’t restrict any of my movement. This is sometimes a problem as I have a large upper back and some gis fit me too tightly there. 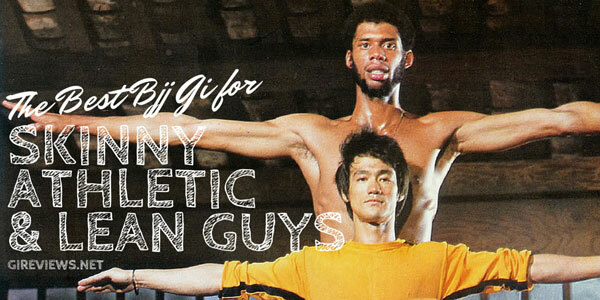 Hypnotik offers the collection of BJJ gis that’s perfect for you! The trousers (trousers > pants) on the Ronin Brand Insignia are very clean with their only defining feature being a very long drawstring for us big guys (thanks Ronin) and the leg taping. The leg taping has held up well so far and I expect it to be fine in the future (unlike Gameness who have had a lot of problems with theirs). Like I said, I originally thought the Ronin Brand Insignia drawstring to be too long, but once I tied it, it was perfect. The trousers offer multiple belt loops for a pretty secure fit. Rolling in this gi was great. Although I typically prefer heavy gis to roll in because I hate having a thin collar, the collar on this gi was pretty nice. I haven’t measured it yet, but I feel like it’s a bit more hefty than the collar on my Black Eagle Predator gi. 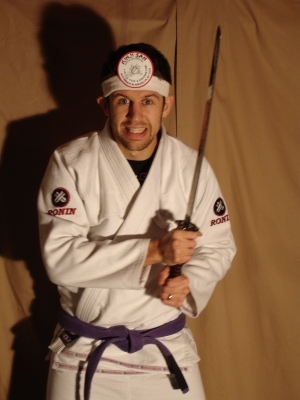 The white gi is fantastic, but if you have a wild and crazy guard game (read: uncoordinated and kind of spazzy) like mine, I would not recommend a white gi because blood splatter shows up very easily, but washes out pretty well on this gi (Thankfully!). This gi is excellent. 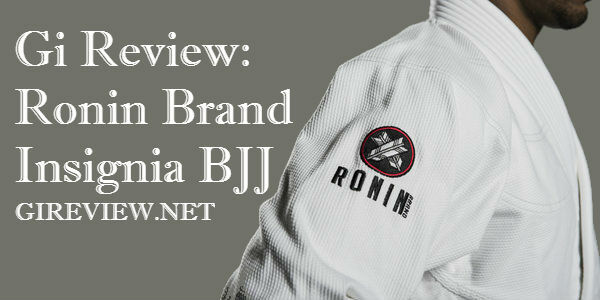 Ronin Brand and Kinji San are taking high quality BJJ gi prices back to where they should be. At only $115 for my gi at the time of publishing (not to mention a SUPER sale they had on Black Friday of this year), this gi is a steal. It easily could sell for 160 or 175 if it was relabelled to another brand and if you care more about the quality of your gi than the name printed on it, you’ll love the Ronin Brand Insignia. As a fan of flashy gis, I would love to see what they offer in that department (since the Ronin Brand Insignia gi is so clean), but Ronin has been making gis and kimonos for other martial arts for over 30 years and I don’t expect them to go anywhere any time soon. If you ever have any questions about this gi, please e-mail me (brendan.gireviews[at]gmail[dot]com) or give Doug a call at Kinji San (718)338-0529 (and let him know I sent you!). I will definitely buy from another Ronin Brand Insignia or another gi from Kinji San in the future. 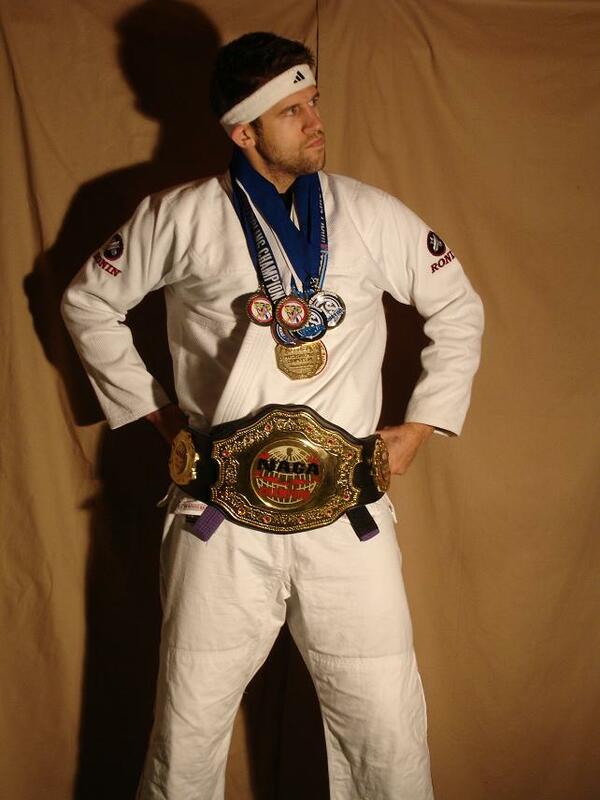 Ronin Brand has been making martial arts uniforms for years. Ronin Brand operates out of Kinji San Martial Arts in Brooklyn, NY, Ronin Brand provides high quality gis that are very fairly priced. 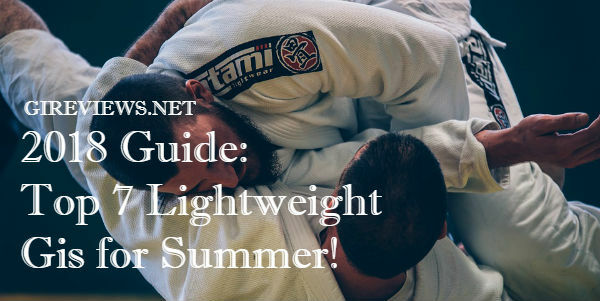 I hadn’t heard about Ronin before a few months ago, but once I started asking people about them, it seemed like a lot of people from the East Coast BJJ scene and even more judo and karate practitioners had heard about them. No wonder, since they’ve been in business since 1976. It is very easy to contact via phone, e-mail, or on their Facebook page. 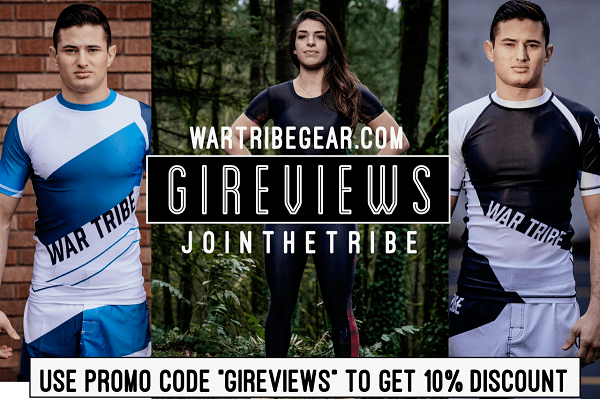 It is not at all out of the ordinary to recieve a very prompt or even immediate reply from them regarding inquiries about Ronin Brand BJJ Gis. Like I mentioned above, I had the great opportunity to speak with Doug from Kinji San for a while on the phone about the various gis that they carry, especially the Ronin Brand Insignia and I definitely suggest that if you live in New York, you get there right away, and if you don’t, give Doug a call because his customer service is top notch! Ronin Insignia gis are my favorite. They are very light, very comfortable, and have a nice fit. Unlike some of my other gis, both flaps on the Insignia close and fit nicely around the body. 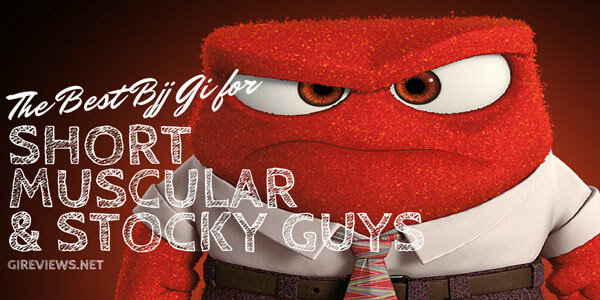 Kyle, you can pick one up right now for only $85 shipped on http://www.bjjhq.com it’s probably the best deal you’ll ever find on this gi. Depending on how that weight sits on you, either an A1 or A2 will fit. I am 6’1″ and 200 so I wear an A3.